Hello and welcome to the Feline Chronic Renal Failure Information Center. If your cat has been diagnosed with chronic renal failure (kidney failure), we would like to extend our sincere sympathy and express the hope that you will find some helpful information and support in the following pages. Your initial reaction to the diagnosis may be depression and a feeling of helplessness. This is normal. 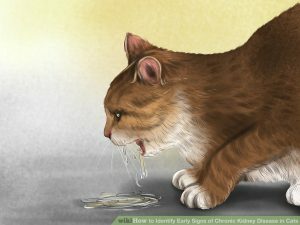 While feline chronic renal failure is progressive and terminal, with some effort, a lot of love, patience, dedication and an early diagnosis, the condition may be managed effectively for some time. Each cat is an individual and there can be no set life-span for a cat in CRF. It depends on how well the cat responds to treatment and treatment varies with each cat. The earlier the condition is detected, the easier it is to stabilize and maintain a good quality of life for the cat. Having gone through the experience of caring for a cat with CRF for nearly three years, we wanted to share what we learned with others who are faced with a similar situation. Our struggle was not easy, but we would not hesitate to do it again. We wish to acknowledge the invaluable aid and guidance extended to us by Avatar’s veterinarian and our many online friends without whose assistance and support this Web site would not have been possible. This Web site was created in an attempt to make the search for information about feline chronic renal failure faster and easier. Under no circumstances should the information contained in the Web site be considered authoritative. It is vital that you consult with your veterinarian before beginning any course of treatment. The information we have gathered will, we hope, help you formulate intelligent questions for your veterinarian and to better understand the answers. Before you start to tour our Web site, it may be helpful to first click on the “Site Guide” link. This will open a guide to the Feline CRF Information Center. In February, 2007, at age eight, Duncan was diagnosed with both CRF and restrictive cardiomyopathy. After nearly ten CRF-free years, we again resumed the role of caregivers. We rode the emotional roller coaster for nearly four years. We have written a journal about our experience with this unexpected diagnosis and the steps we took to help Duncan. Duncan brightened our lives with his happy-go-lucky, spirited, loving and affectionate personality. We have placed a photograph of Duncan in the Memorial Gallery and we have put a Tribute in the Tribute Gallery. On July 4, 2012, we said goodbye to the sweetest, gentlest and most graceful cat there ever was. Joseph was Duncan’s littermate and brother and outlived him by a year and a half. We treasured every second with Joseph. He, too, was diagnosed with both CRF and restrictive cardiomyopathy and other conditions. . His Memorial photo and Tribute are online. Thank you for your beautiful, caring, comforting and eloquent letters, poems and cards of support to us and also for your contributions to the Feline CRF Information Center in memory of our boys. It is very much appreciated. We are trying to adjust, but it is very difficult. We thank you so much for your support during this very sad time in our lives. While we have tried to verify everything that has gone into the Web site, you must bear in mind that the information contained in these pages was not written by veterinarians. If your veterinarian flatly contradicts something we have said, assume that the veterinarian is correct and we are wrong. We have put a great deal of effort into the research for this Web site, but the life and health of your cat are in your hands and the hands of the professional veterinarian you have chosen. It’s important to remember that each cat is different and what is right for one could be a disaster for another. It is not our intention to advise on medical matters nor do we have the expertise to do so. We are not veterinarians. We are merely sharing information that we have accumulated during our fight with our cat’s chronic renal failure. While we believe the information contained in these pages is reliable, it is possible that some of the information may be inaccurate, incomplete or out-of-date and therefore we assume no responsibility for, and make no warranty with respect to, results that may be obtained from the procedures, products or dosages listed, and do not necessarily endorse the use of such procedures, products or dosages. The medications described herein should only be used if prescribed or recommended by a licensed veterinarian. Always seek advice from your veterinarian before undertaking any course of treatment for your cat. Although efforts were made to avoid redundancy, some topics were too important not to be emphasized where needed and may be found in more than one place. For the sake of simplicity, we have used the pronoun ‘he’ when referring to cats in general. This does not indicate that the information is gender-specific.